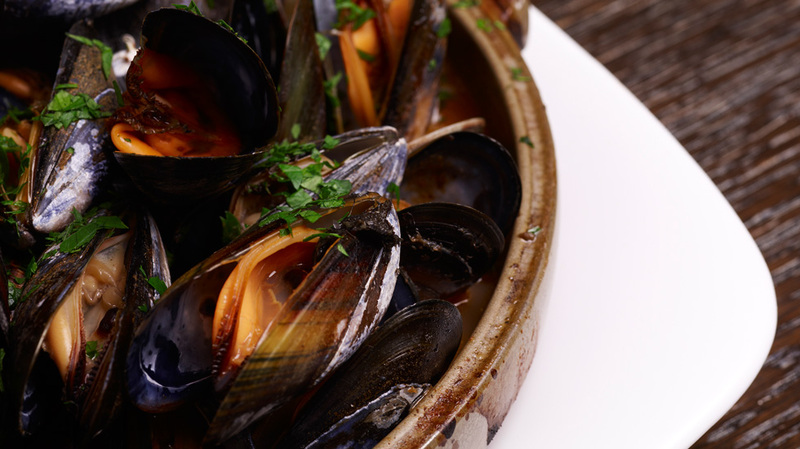 Steamed Mussels with Tomato & White Wine — Laura Santtini | Life is Delicious! This is a quick and easy way to cook mussels and based on the way my grandmother used to make them. Make sure you have plenty of crusty bread to mop up all the lovely juices. Try this preparation in a cast iron skillet on a very hot grill for a deliciously smoky variation! Heat the oil over a medium heat in a large pan which has a lid. Add the garlic, salt and pepper and cook for another 2 minutes. Now stir in the Bomba, then add the wine and leave to simmer for a further 2 minutes. Add the mussels and ½ cup of water to the pan. Give the pan a good shake, cover and leave to bubble for 5 minutes or until all the mussels have opened. Divide the mussels between serving bowls, ensuring to remove any mussels that have not opened. Sprinkle with parsley to serve. Use a heavy cast iron skillet. Preheat grill with skillet on grill. Add oil and then stir in onion and cook for about 2 minutes. Add garlic and season with salt and pepper. Stir in Bomba and wine. Close grill for 2-3 minutes. Open and add 1/2 cup water and the mussels and toss mussels with cooking liquid and onions. Close grill for 3-4 minutes. Stir the mussels for and close grill for another 3-4 minutes. Remove skillet and transfer mussels to a bowl with a slotted spoon. Discard any that haven't opened.